All dressed up for Melbourne Cup! The Melbourne Cup has a way of drawing everyone in and for the patients and families in the Hospice they too look forward to this special day. Each year the Foundation organises a small celebration and we get together to watch the race with much anticipation. This year we provided platters of food and a drinks trolley for all to enjoy. Plus the ‘free’ sweep meant that at least 12 patients and visitors received a gift of Cadbury Chocolate. For many of us – this was the best win of the day! Even the last place horse, named Rose of Virginia became a winner for someone special in the Hospice. Each patient received a jockey cap at the start of the day to add to the fun and to help set the mood for the afternoon’s celebration. 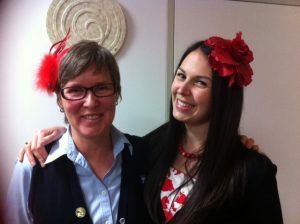 And many visitors and staff donned fascinators which created a splash of colour and a bit of class. Celebrations like the Melbourne Cup cost the Foundation a few hundred dollars but the impact is priceless. Patients and family members have something to look forward; a welcome distraction from what is going on around them. Visitors who struggle to drop by, find it easier to do so and for an hour or so, life becomes ‘normal’ for those in the Hospice. So well done to Almandin for winning the cup this year but the real winners were all the patients, families, visitors and staff and volunteers who made the Melbourne Cup a truly special afternoon again this year. Each month we aim to deliver two special treats to help brighten the day. You might like to make a gift to support our next group experience in the Hospice. It could be a pizza night or an ice cream machine in the family kitchen, the cheese and wine trolley or other fun celebrations like Melbourne Cup or Grand Final Day.